I’m so excited to be able to share news about a project that is near and dear to my heart! The Frederick Speaker Series is a project that I’m proud to have been a part of over past year. I originally got involved through sponsorship via my work and eventually jumped on board to help with the marketing efforts. 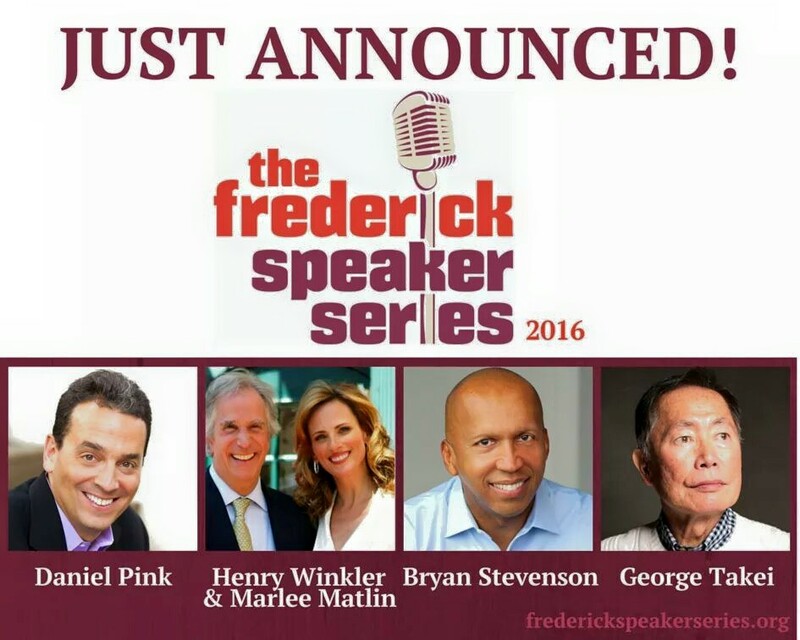 The 2016 lineup, which has just been announced, includes non other than Daniel Pink, Marlee Matlin and Henry Winkler, Bryan Stevenson, and George Takei. So, not only can you get the opportunity to see these wonderful folks speak, you can also get up close and personal with them by purchasing a special VIP ticket to a backstage meet-n-greet which benefits children’s programs at Frederick County Public Libraries. Daniel Pink is the best-selling author of “To Sell is Human,” “Drive,” and “A Whole New Mind.” Named by Harvard Business Review as one of the world’s top 30 business thinkers, Pink’s 21st-century approach to behavior is reshaping how organizations view innovation. His TED talk on the science of motivation is one of the 20 most-watched TED talks of all time. Henry Winkler’s ten seasons as the iconic Fonz on “Happy Days” made him one of the most recognized actors in the world. Over three decades ago, Winkler – who endured a childhood struggle with undiagnosed dyslexia – recognized a kindred spirit in profoundly deaf actress Marlee Matlin. In 1987, Matlin became the youngest recipient of the Best Actress Oscar® for her lead role in “Children of a Lesser God.” Now, together on stage, Winkler and Matlin delight audiences with intimate dialogue and personal anecdotes, providing inspiring insights about overcoming adversity. Bryan Stevenson is one of the country’s most visionary legal thinkers and social justice advocates. Creator of the Equal Justice Initiative, Stevenson is a founding leader of the movement against mass incarceration in the United States. He recently served on President Obama’s task force for 21st-century policing. His memoir, “Just Mercy,” was awarded the Andrew Carnegie Medal for Excellence in Nonfiction. Time magazine named Stevenson one of the 100 Most Influential People for 2015. George Takei is known around the world for his role as Hikaru Sulu in the acclaimed television series “Star Trek.” From a childhood spent wrongfully imprisoned in a Japanese internment camp during WWII, to becoming one of the country’s leading figures in the fight for social justice, LGBTQ rights, and marriage equality, he remains a powerful voice on issues ranging from politics to pop culture. Want to buy tickets? OF COURSE YOU DO. Tickets will go on sale to Weinberg members on Tuesday, August 4, at 10 a.m. (Series subscriptions will also be available at that time.) Tickets will go on sale to the general public on Tuesday, August 18, at 10 a.m.
You can purchase them online at FrederickSpeakerSeries.org, by calling the Weinberg Center box office at 301-600-2828, or in person at 20 W. Patrick Street in Frederick, Md. If refuse to wait and want details on becoming a Weinberg Center member and gaining early access to tickets, visit WeinbergCenter.org/Membership.